Selk'bag Chewbacca is so flexible and compact that not only it will keep you warm but very easy to carry it anywhere you go for an outing. Its a one piece wearable sleeping bag from Selk'bag featuring a printed inspiration by Chewbacca that's perfect for camping, lounging, sleepovers and road trips. It features a soft lining, insulated hood, and water resistant lining and has a 40-degree temperature rating. "The only thing worse than being without a sleeping bag after co-piloting the Millennium Falcon is leaving a warm one. 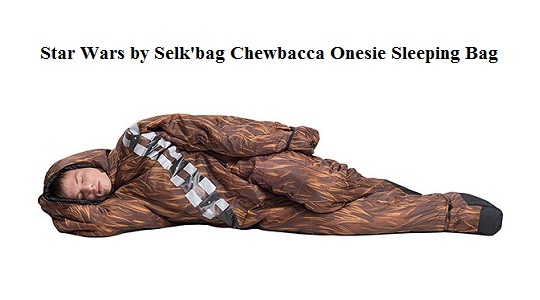 This soft and cozy wearable Chewbacca sleeping bag allows you to put up your hood, take a nap, and stay warm anywhere in the galaxy."